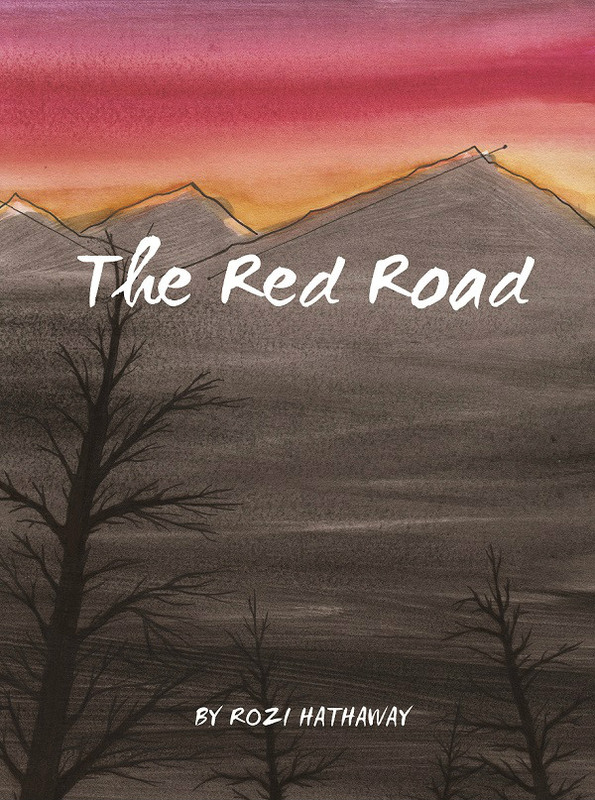 Earlier this year Rozi self-published her first solo print comic, The Red Road. A tale of Native American spirituality, I reviewed the book in this column here noting then that she was one of half a dozen new talents I felt particularly deserved to be elevated to the next level of recognition. ANDY OLIVER: You’re one of the six UK small press comics creators that I recently highlighted at Broken Frontier as people to watch in 2015. 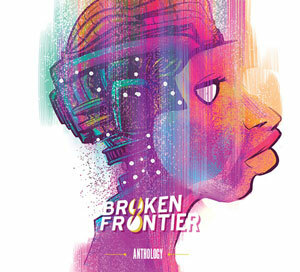 As a newer name on the scene could you tell the Broken Frontier audience about your journey into the world of comics to date? ROZI HATHAWAY: Well, I read The Beano quite a lot from when I was about 7 years old, or so. I think my Dad used to read The Dandy when he was a young ‘un, so I followed suit in that respect. Though, I didn’t really get into graphic novels and comics again after that until I was 14 or 15 and I was introduced to a copy of The Crow by James O’Barr. I remember how moved I was, and still am, by that story. After that I slowly picked up more and more graphic novels, and became totally absorbed in tales of heartache and loss. I’m a cheery bugger, I know. You combine your comics work at the moment with studying for a BA in Illustration. What is it about comics as a storytelling medium that most excites you? And to what degree have your studies informed your approach to sequential art and vice versa? Comics just have a complete, overwhelming power to draw you into a different world. Books in general are an incredibly powerful medium, but being able to successfully use narrative and image together to complement each other? It’s an unstoppable force. It makes me really sad when people say they aren’t into comics, because comics can cover such a broad range of subject matter there really is something for everyone. And, I don’t like being sad. So, all I can do is hope that I can move people with my own work, and expose folks to the varying possibilities of storytelling (that don’t involve colourful underpants and hemmed capes). In terms of University, I had already completed my pages for HOAX Psychosis Blues before I started the course as a mature student; I was already well and truly absorbed into comics, possibly to the annoyance of my lecturers. It does make it a little harder to make my work suitable for commissioning areas, because it all feels a bit soulless if I don’t have characters to relate to, but that’s something I’m slowly learning how to adjust to with each project. I think working in a narrative setting has helped my composition of one-off illustrative pieces, though, so there is a plus side! Even though the stigma of comics has lessened in University courses, it’s still a hard gap to bridge when so many projects rely on purely one-shot pieces. But that’s where the money is, so it’s about developing a happy medium. Your contribution to Ravi Thornton’s graphic memoir HOAX Psychosis Blues last year (sample images above and below) was your breakout moment in comics, and the point at which most readers would have first become aware of your work. How did you become involved with that project? Lo and behold, I said yes, and three months later I started the most challenging work of my life to date! At the time I’d spent a year and a half really, really focusing on my drawing and I hadn’t produced any comics by that point, just a few images that could work together sequentially. So really, Ravi took a huge leap of faith in taking me on, and I’ve been eternally grateful ever since. Not many artists can say their first professionally published comic material was part of an anthology that included the likes of Bryan Talbot, Karrie Fransman, Rian Hughes, Hannah Berry and Mark Stafford. Was it daunting, as a relative newcomer, to be part of a project that had a list of so many respected names in UK indie comics attached to it? Daunting? I was absolutely terrified! For the most part I had no direct contact with anyone besides Ravi, so I could avoid thinking about the pressure of having my work alongside such masters of their craft. It wasn’t until we were sent the digital pages that it became ‘real’, so to speak, that everything really sank in. Everyone involved in the project was so incredibly nice, I really did my best not to look like a deer in headlights but the whole release for HOAX was such an overwhelming experience it’s still a bit of a blur. And it was nothing to do with that large mojito! 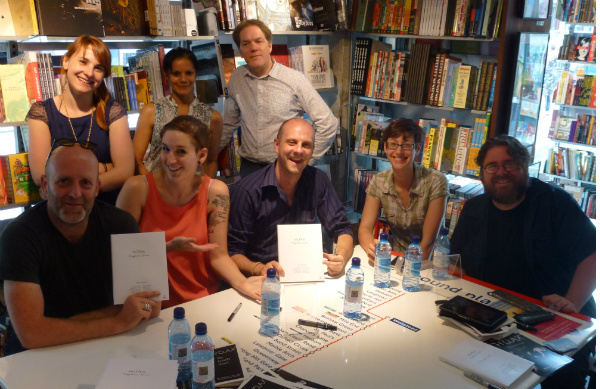 The HOAX Psychosis Blues signing at London’s Gosh! Comics last summer. Standing from left to right – Karrie Fransman, Ravi Thornton, Rian Hughes. 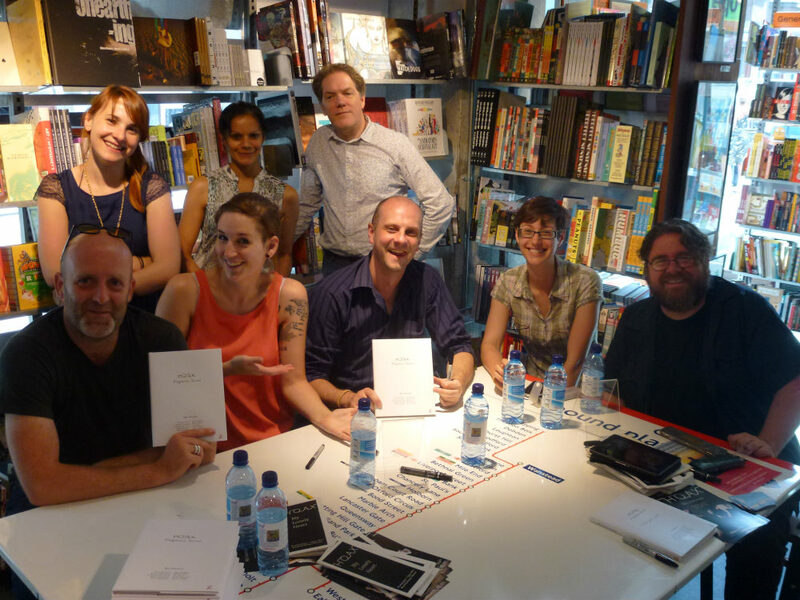 Seated, left to right, Julian Hanshaw, Rozi Hathaway, Ian Jones, Hannah Berry and Mark Stafford. 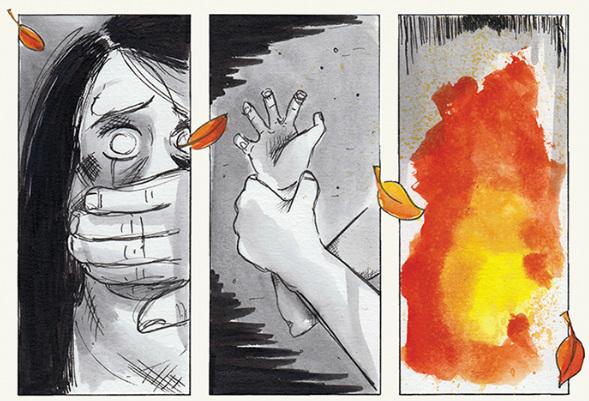 The section of HOAX Psychosis Blues that you illustrated was the pivotal narrative sequence of the book. Can you tell us a little about your collaborative process with Ravi on those pages? Of course! As I was such a newcomer to the whole process, Ravi gave me a lot more guidance than the other contributors, and her assistance helped me a considerable amount. The great thing about working for Ravi is that even though I barely knew what I was doing, she still completely respected my opinions and work as an artist, and her guidance was always in the most supportive nature. I re-drafted the thumbs and all of the pages a lot. And then a whole lot more. At the time I was working a miserable full-time job, different shifts every week, and then chugging my bodyweight in caffeine in the mornings and evenings to get my HOAX pages done. It was exhausting, but it taught me a hell of a lot about narrative; Ravi patiently helped me through whilst I felt my own way through each panel and page. It was a very rewarding experience. The Red Road is your first solo print offering and one that I recently reviewed at Broken Frontier, describing it as “stunningly rendered, and painfully beautiful in its own way, The Red Road is an outstanding debut print offering.” Can you give us some background on the beliefs that inspired the project and why this was something you wanted to bring to the comics page? Before I decided to quit my old job and focus on drawing for the rest of my days, I used to madly save my pennies and travel quite a bit to my family in the States, both in Arizona and Colorado. During these adventures I travelled to various museums and art galleries that looked at Native American life and beliefs, and being a complete sucker for any sad story, I fell in love with it all! 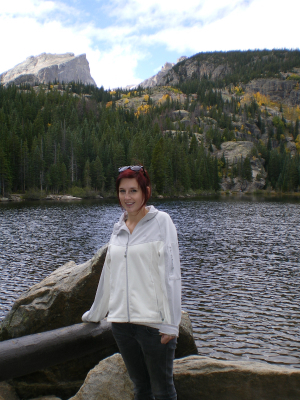 In 2010 and 2011 I spent time in Colorado, in the heart of the Rocky Mountains (right) – I felt such a sense of awe, I’ve missed it ever since (Northampton’s infamous Lift Tower doesn’t really compare, unfortunately). This, culminated with reading books such as Bury My Heart at Wounded Knee by Dee Brown, I had plenty of ideas buzzing around my head. On the story side of things, over the years I’ve had friends who have been through ultimate pain and trauma in their childhoods; I wanted to use the idea of these memory flashbacks which can override all thoughts at any moment, from any trigger, to emphasise the pain of the character. It’s all too easy to say in a preface that this girl went through an incredibly horrendous ordeal, but to integrate these memories with current-time triggering moments is, I feel, more accurately portraying the after-effects of surviving through such an experience. The Red Road in itself actually came about through a very open, narrative-based University brief which required us to create a set of images or a narrative based on a piece of text or poem. After some searching, I found the poem To Walk the Red Road, and then from a week of research and character drawing I had seven weeks to finish the project. And that I did! Needless to say, I was pretty tired afterwards. What has reaction been like to The Red Road in the two months or so since its publication? Have you been pleased with the feedback? I have been completely blown away by the feedback! I have your review framed on my wall, and I am continually amazed by the kind words and support from people. It’s been pretty crazy really; I released the comic on the 15th January and less than three months later I’m left with just over twenty copies. It still feels like a strange dream – Gosh! Comics took on copies and I’m now on their centre table, Travelling Man in Manchester has a few, OK! Comics in Leeds, Nostalgia & Comics in Birmingham… It’s still quite surreal, and possibly the biggest compliment of my work to date. One of the most notable things about your work to date – and something that is very apparent in The Red Road – is your ability to tell a story with very little exposition in terms of narration or dialogue. It’s very pure comics in that regard, very much in the “showing not telling” school of sequential art. Is that something that you’re conscious of in your work? Is it a deliberate choice? I think the limited narrative of The Red Road assisted the mood of the story, keeping it mysterious and very uncomfortable at times. 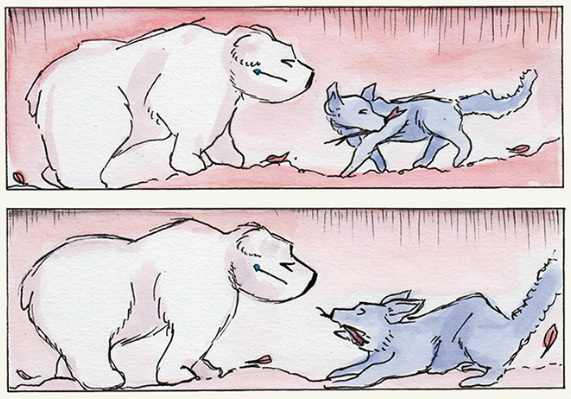 I absolutely did not want to make it too gimmicky with any over-use of speech bubbles, given the content of the story. Plus, y’know, the mountains are really peaceful and quiet, and I wanted to convey the omnipotent feeling they convey. For future projects I guess it depends on the content. I’m not against using speech, I just like to try and tell the story via image as much as I can as I think it’s a very powerful tool. In short, yes, I suppose it is a conscious decision. The feeling I strive for in my work is pure emotion, whether it’s sad, depressingly sad, or heart-warming and I think that strong emotions are better portrayed with a limited narrative as you can really feel the silence. Can you give us some insight into your creative process? In terms of your art what medium of presentation do you most gravitate towards? Well, with comics I usually get my idea and mull it over in my head for a little bit, then use the snowflake writing technique to get a good idea of what I’m doing; describe the story in a sentence, then in a paragraph, and then usually I stop there as novels aren’t my strong point. After this I sketch up the characters and really get to know them – as silly as it sounds, I like to have an emotional bond with who I’m drawing. Comics artists spend so long drawing the same people over and over again, it really helps to know the character as if they’re your best friend. After that, I do a loose script to figure out pages, and then go deeper and look at how I can utilise panels and the good ol’ ‘power of the page turn’ to my advantage, and then mock it all up. It’s a science, really! After the roughs are drawn up in a mock-comic I tend to dive straight in and work it out as I draw. University like you to draw everything about twenty times before doing the final piece, but I prefer working it out as I go along as it feels more natural that way, especially important with telling an emotive story. Or so I think, anyway! As for materials, I use pencils and fine liners for the drawing, then either gouache, watercolour or inks for colouring. 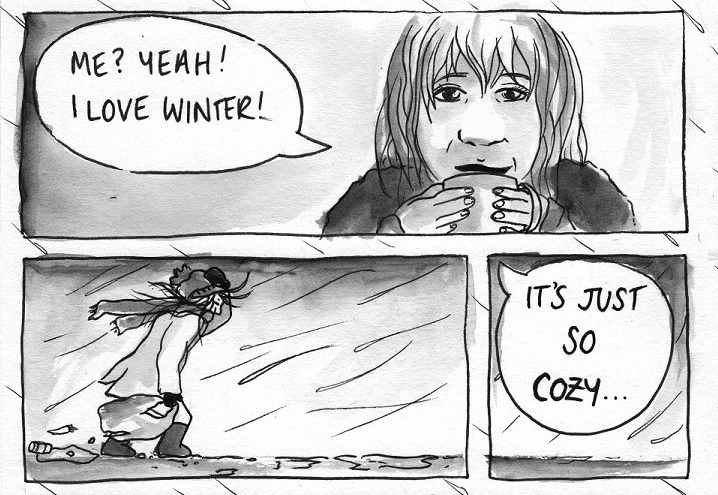 I complete everything in Photoshop and sometimes In Design, which is especially useful for comics. I like to keep trying to push my techniques though, and I recently got some shiny new colouring pencils I’d like to properly try out soon. Who do you count as having the greatest influence on your style, both from within the world of comics and outside it? James O’Barr’s The Crow, as I previously mentioned, got me into comics and graphic novels, which was written and drawn from a place of pure emotional pain. That kind of raw torture is portrayed so beautifully, it’s something I definitely strive for in my work. 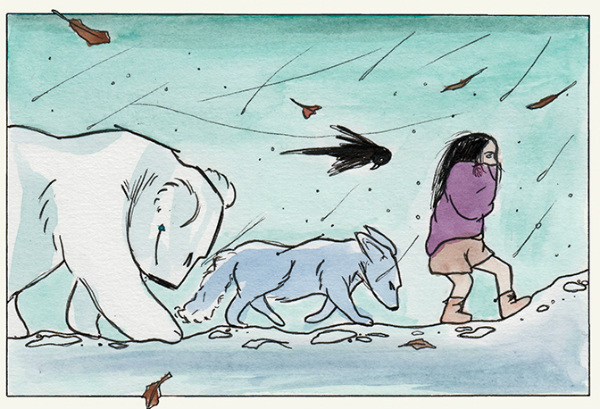 Jeff Lemire’s storytelling and emotive drawing have also been hugely influential on the way I use narrative. In Essex County he really does tell the story in places with minimum text, and it’s heart-wrenchingly beautiful. Outside influences are definitely based on personal experiences and adventures. I don’t like being in one place for too long, so I draw a lot on what I see out and about. For those Broken Frontier readers looking to meet some of my ‘Six UK Small Press Creators to Watch’ in the real world which comics shows, festivals and fairs will you be exhibiting at this year? It’s turning out to be a bit of a manic one this year, first of which is being on the First Publications table at the Alt Press Takeover event on Saturday 9th May in London. I believe my face will be hovering behind the table on a rota’d basis, but when I’m not there I’ll be having a mooch at all the other creators’ work. I’ll be attending CECAF at Earl Haig in June with yourself, which has only just been arranged – should be fun! I’ll also be at MancsterCon which I’m really excited about – they’re a small indie comic-con held this year in Media City UK in Salford Quays on Saturday 29th August, and I’m chuffed that they are including me as an honorary Northerner! Finally, I’ll be at Thought Bubble for the first time ever on the weekend of the 14th-15th November trying to not have a fan-girl moment at all the amazing talented people there. It’s going to be a busy first year on the comics festival circuit! What else are you currently working on? What can you tell us about other projects that we can hope to see from Rozi Hathaway in the near future, (particularly the zine you’ve been talking about on your blog and on Twitter recently)? University projects are still being tweaked before my final deadline in May, so once that’s all done I’m thinking I may bridge the summer gap with something small and interesting.. But you’ll have to wait and see! Yes, as you mentioned I’ve worked on a collaborative zine recently (below left) which will be up for sale on my Etsy site from mid-April, and also I submitted a one-page comic to Keara Stewart’s upcoming zine anthology which I’m really excited about seeing! In terms of the ‘next big thing’ news,, I have a rather sizeable idea in mind for my final major project as I approach my third year, but that won’t be completed until May 2016 so I’ll definitely have to keep you all interested until then, won’t I? And, finally, what targets have you set yourself for this year? Where would you like to be with your comics practice by the end of 2015? 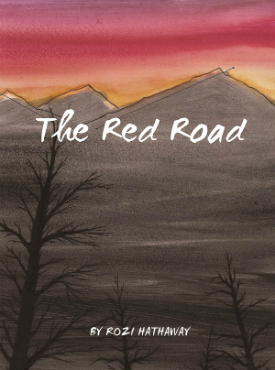 My original goals coming into this year was to sell at least half of my copies of The Red Road before September, and I kind of already stomped all over that! So, I think I’d like to shift what’s left of my stock and definitely get a new second-run out with added content at LEAST before Thought Bubble, hopefully before. And, as I mentioned before, I’d like another little something completed for print over the summer. 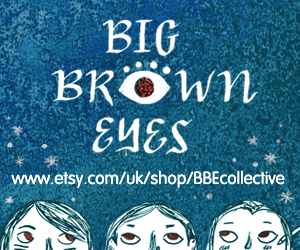 By the end of 2015 I’ll just be thankful if people are still interested in my work, but I’d definitely like to see a fuller Etsy store, some more competition entries under my belt and hopefully another great Broken Frontier review framed on my wall! 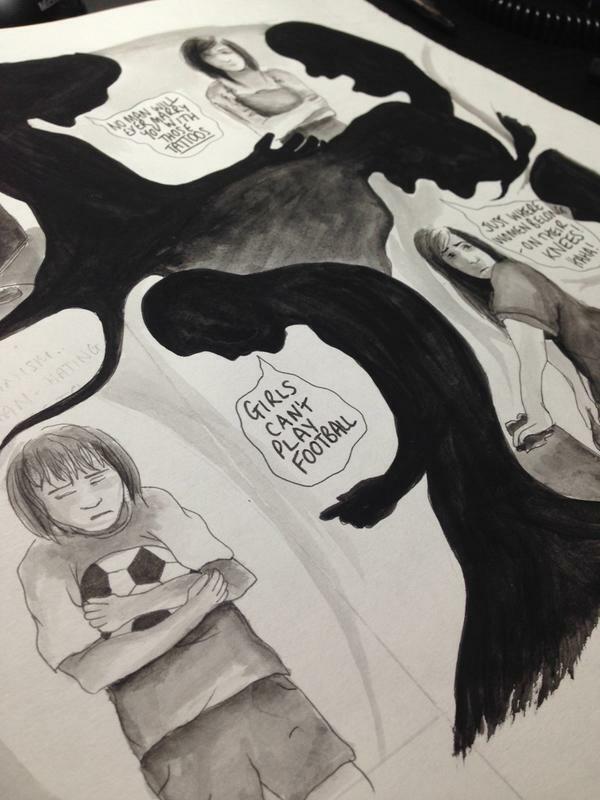 For more on Rozi’s work check out her blog here. You can follow Rozi on Twitter here. The Red Road can be ordered online here priced £6.00 and Broken Frontier Award-nominated HOAX Psychosis Blues can be ordered online here from Ziggy’s Wish priced £15.99. Thanks Keara. Rozi’s work has such grace to it – definitely an artist to keep watching! 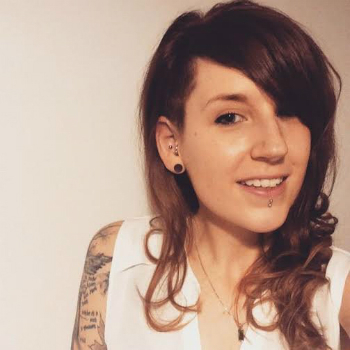 Rozi Hathaway is an inspirational creator, thank you for this excellent interview!